I do like the odd stick of Peperami with my lunch. The odd bite of meaty salami in between crisps, sandwich and chunks of tomato really mixes things up. I do miss the Peperami adverts. Now they were odd, but rather funny. They should do more… Or they may still do, but I have a bad habit of recording everything and winding through adverts so they still may be doing them and I just don’t know it? Maybe I’m a little odd too…? 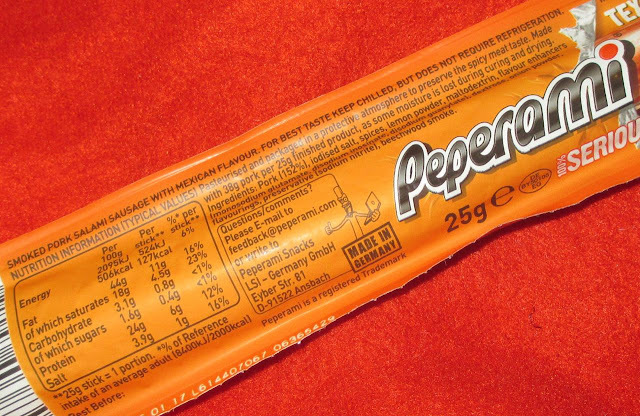 Anyway, this is the New Mexican flavour salami stick from Peperami promises spices and smokiness. On opening the packet there was a very spicy smell, possibly mainly paprika and a smoky salami smell. On first bite I found this New Peperami Tex-Mex really very tasty indeed. There are lots of spices, there is the strong beechwood smokiness, and there are hints of onion and citrus in the flavour. Each bite is mouth-wateringly delicious. Each bite I couldn’t help sucking the salami (now hang on… that doesn’t sound right) to bath in all the sumptuous flavours. You can tell I like this. I know there are another two of these in the fridge, so they better watch out! 25g stick of 100% pork having 127 calories, 11g of fat, 0.4g of sugar and 1g of salt. See photograph for ingredients.